We honor the late Joe Cuba with this encore portrait of "Bugalú," produced for Afropop Worldwide by Ned Sublette. Bugalú is the Spanish spelling of boogaloo, and was also known as “Latin soul.” It hit the scene in 1966 with the original and organic concept of combining black and Puerto Rican music. The dance club crowd went crazy and then the fad quickly faded. But what a ride along the way! Joe Cuba was one of bugalú’s most popular artists, best known for the major hit “Bang Bang” that his band created on the spot one night at a club. Joe was a mesmerizing storyteller, and we’ll hear some of the major bugalú stars tell their stories, including Johnny Colon (“Boogaloo Blues”) and Tony Pabón (lead singer with Pete Rodriguez of “I Like It Like That” fame), and of course Joe Cuba himself. Ray Barretto http://youtu.be/GeI7cQe9ilU Though Barretto was not a bugalú artist per se, he had an important Latin soul hit with 1962’s “El Watusi.” Born to Puerto Rican parents living in Spanish Harlem, Barretto was raised on a steady diet of his mother’s favorite American jazz artists, Duke Ellington and Count Basie. During a stint in the military he met Fats Sadi, a Belgian vibist who introduced him to Dizzy Gillespie’s collaborations with Cuban percussionist Chano Pozo. Barretto was inspired and dedicated himself to mastering the congas, and ultimately became one of the bandleaders most identified with the glory years of the salsa boom. Pete Rodriguez http://youtu.be/o94ONWhKwX4 Hailing from the Bronx, Rodriguez scored his biggest hit with the tracks “I Like It Like That.” To read more about his music, check out this excellent article on Pete Rodriguez and Ozzie Torrens. Joe Cuba http://youtu.be/mXtleF5mTiU Joe Cuba (Gilberto Calderón), the Big Daddy of bugalú, had a breakthrough pop hit with “El Pito (I’ll Never Go Back To Georgia),” though none of the members had ever been to that state. 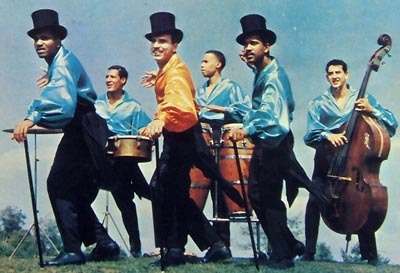 Cuba’s sextet, featuring future Puerto Rican singing idol José “Cheo” Feliciano on lead vocals and Jimmy Sabater on timbales, was at the forefront of the bugalú movement and scored its biggest pop hit, 1966’s “Bang Bang.” Johnny Colon: http://youtu.be/W0dwcW3f33k Johnny Colon’s “Boogaloo Blues” was an enormous hit, branding the style of music with its name. A dedicated educator, he opened the East Harlem Music School in 1968, which has many well-known alumni and is still open today. Richie Ray http://youtu.be/URRP8HwOXhQ Born to Pacífico Maldonado, an accomplished guitarist from Puerto Rico, Richie Ray’s musical education started early and lasted long. Ray began piano lessons at the age of seven, started playing in bands at twelve, and attended both the High School of Performing Arts and Juilliard School of Music. After recording a group of singles for Fonseca Records, Ray moved his band to Alegre Records, the same label that released many of Pete Rodriguez’s records. Ray was enormously popular on the island of Puerto Rico. His biggest hits, including “Mr. Trumpet Man,” were in partnership with Bobby Cruz. Both of them are still active today, though they both became evangelical ministers and dedicated their subsequent music to that work. For more information- and to hear more classic bugalu- you should check out Oliver Wang’s writing on NPR- as well as the Soul Sides Blog.